From this day, say we, it lives on every Plus C.
For Doors CSE sound the bells. Doors CSE 8.0 is a shell for the TI-84 Plus C Silver Edition. It is an extension of Doors CS to TI's new color-screen calculator, and provides everything you might expect from older shells like Doors CS, MirageOS, or Ion. 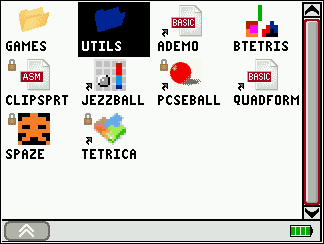 Doors CS lists and can run all of your TI-BASIC and Assembly games and programs. It lets you organize your programs into folders, and archive, lock, copy, rename, delete, and hide them. 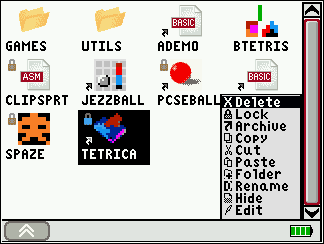 It gives you extra features like an enhanced TI-BASIC editor, a clock, lowercase letters, and much more. 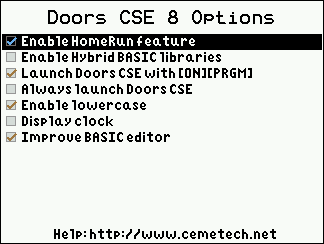 Doors CSE 8 also contains the powerful xLIBC library by Patrick Prendergast and Celtic 2 CSE, which will make color TI-BASIC programs and games more powerful, useful, and fun. In development for exactly two months, Doors CSE 8 is the culmination of hard work not just from myself and Patrick "tr1p1ea" Prendergast, but from all the beta-testers in the community who worked hard to squash any and all bugs from the shell and its libraries. They deserve our gratitude for their persistence and efforts. We look forward to feedback and any rare bug reports that may crop up, and we especially anticipate Doors CSE 8 and a crop of powerful TI-BASIC and z80 Assembly educational programs, utilities, and games hitting every TI-84 Plus C Silver Edition soon. The shell is cool too. I immediately put it on my calc, it's really awesome I actually prefer the cursor over the mouse, it makes everything faster. Congrats on this ! i slightly wish i had an 84C, now that you have released this to the world. albeit flat, it is surely going to set a standard for todays programs in the TI world. I also have one in the works, once I can get time to sit and work on it. Congrats to those that made Doors come to fruition. This is great. Go Go Power CSE! I already made a game that uses DCSE. Hopefully I release more in the near future. You should make them, then! And yes, I've gotten mixed reactions on the mouse vs. selection cursor issue, but most people seem happy enough with this choice. I certainly hope that's true! I can't wait to see what programmers create. Thanks, and right back at you for all your hard work! Which still needs to make it into the Cemetech Archives! I look very forward to your new DCSE games and programs as well. Fantastic work, a great achievement and quite timely to say the least. The shell is a breath of fresh air and should attract more people to the platform. Now to sit back and watch the cool programs & games roll in, great work! . It wouldn't be half as fresh a breath of air without your tireless and amazing work on xLIBC. I hope that programmers validate the effort you put into the library by creating many and varied xLIBC/Doors CSE Hybrid BASIC programs and games. I also look forward to your own work in that space. Thanks, and thanks again for all your thorough beta-testing. I hope that speed issue we were never able to completely pin down never re-appears. It's actually build number 1337, too! I carefully rationed my builds for about three weeks to make that a reality. Of course, if there are any future DCSE versions (which I think there will be), they'll no longer have such elite build numbers. Unless you get to build 31337?! If I get that far, then I don't think I'm apportioning effort between real life and my hobbies properly. 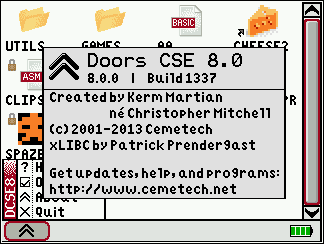 Unless Doors CSE build 1337 is for some futuristic mobile device in ten years, in which case awesome. There are 132 users online: 4 members and 128 guests. © Copyright 2000-2019 Cemetech & Christopher Mitchell :: Page Execution Time: 0.152643 seconds.